Whether you are creating edible landscaping for your homestead or you just enjoy native plants, mayapples are a great choice. Mayapples are fairly easy to grow and this edible wild food can be found for free near many of us. 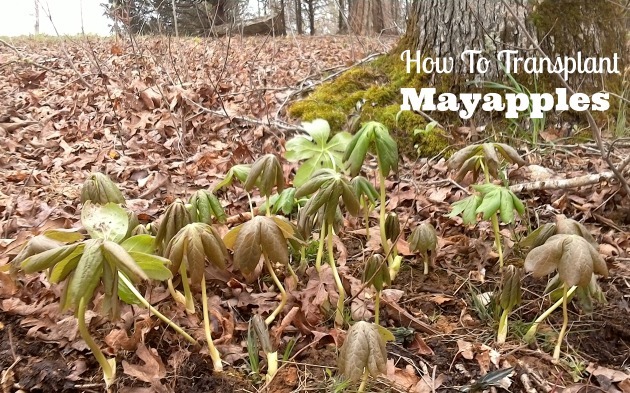 Here is how to transplant mayapples to a place where the wildlife is less likely to grab them up before you can. Please note that mayapple fruit is poisonous when eaten green. First of all, many of you may be wondering, “What are Mayapples?” Well, mayapples (Podophyllum peltatum) are a perennial woodland plant that grow wild in many woods. Mayapple is also known as the “Indian Apple.” The mature may apple fruits are edible and yummy, however, mayapple fruit is poisonous to eat when green. Do not try to eat may apples until they are yellow and soft. 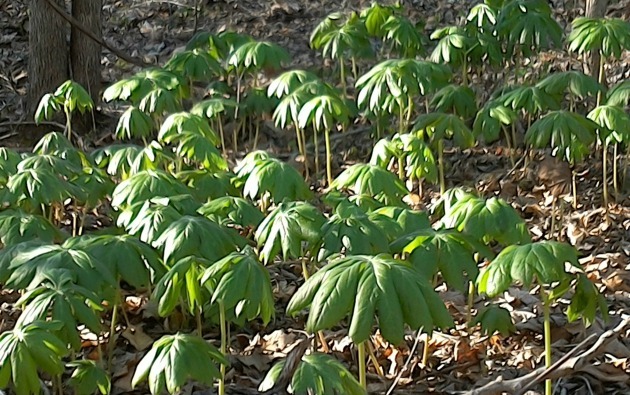 The mayapple plants have green, waxy-looking leaves that can grow up to a foot wide. In May it makes a white, waxy, cup-shaped flower. The yellow fruits are edible and pleasing to taste. This is the reason the wild life such as squirrels usually beat us to harvesting the fruits. That is why transplanting mayapples and having them grow right near your house or at the edge of the woods, offers a better chance at getting them before the local wildlife does. The mayapple plant is a pretty indicator that it is spring as you see the herbaceous shoots of the mayapple plant “thrusting themselves upward through the forest floor like unopened umbrellas” as Mother Earth Living says. Extremely hardy in Zones 4 to 9, this eastern North American native is excellent for naturalizing in woodland settings but the foliage does go dormant in summer. Do you have a patch of woods next to where you live? You might consider transplanting some mayapple plants that grow in the wild where you live. You can propagate this wild edible fruit for easy harvesting, conveniently close to your house and it is a great addition to any edible homestead collection. This woodland plant has a creeping rootstock, and is easily propagated by dividing them. Now, early spring is the season to transplant mayapples. It was easy to find mayapple plants near us. The early spring is a great time to spot mayapples while the foliage is around them is still suppressed, and lagging behind. You may spot them growing in the woods along your road, or in ditches, drain ditches and other shaded places alongside the road. I was able to find some mayapple plants in a ditch on the side of the road in my neighborhood, and I gathered the young shoots which were newly emerged. Then I transferred them to a wooded and shady area right next to the house. I transplanted the mayapples on a cool day in several clusters. They “took” very well. Their little stems perked up nicely the next morning. Just make sure you water them for the first couple of days. Please note that mayapple fruit is poisonous when eaten green. 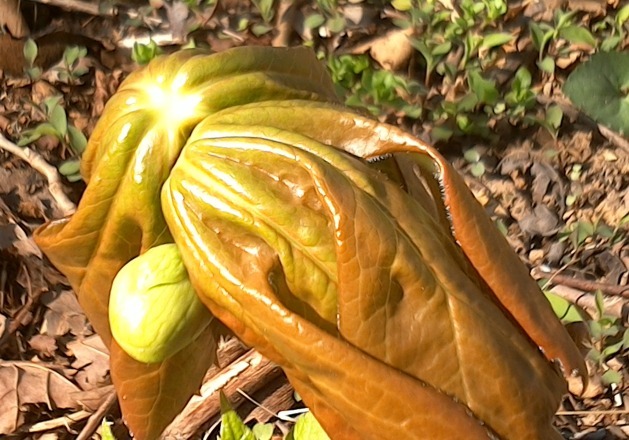 If you need help identifying the mayapple plant, check Wild Wood Survival. 1. First make sure you have some mayapples growing relatively close to where you live, so you can transport them pretty quickly to avoid lots of wilting of your new transplants. 2.Prepare your chosen spot to transfer. I chose close to the house in the shade of some woodland oak trees. 3. Ruffle the dirt and nature’s mulch up a little, so that it is loose and accommodating to snuggling some fresh new shoots down into. 4. Grab your garden gloves, a little trowel, and a cardboard box for carrying them. 5. 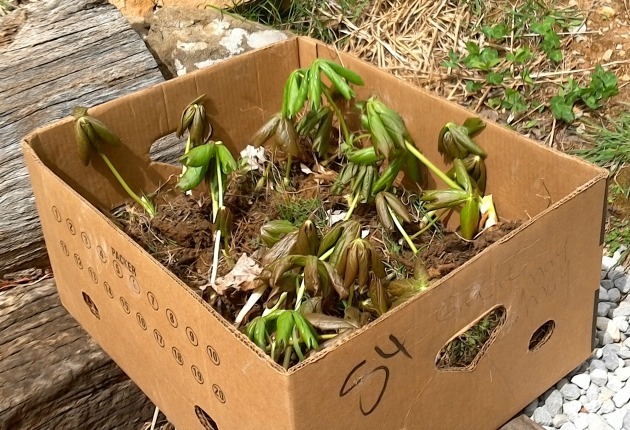 Go gather up the newly emerging Mayapples and put them in the cardboard box by digging them up and keeping their root clusters in tact with the dirt around them. 6. Dig little holes for the Mayapple “starts” (young shoots) into your prepared spot in your new “Woodland Garden.” The holes just need to be big enough to set the roots below ground level. 7. Place soil pack around them pressing down to get out the air. 8. Water the mayapples. Water them again the next day. That is how you transplant mayapples! They should be all set to grow. My Mayapples are growing just fine. I hope you enjoyed my mayapples images. This is what they looked like the second day after I transplanted them. Please note that mayapple fruit is poisonous when eaten green. 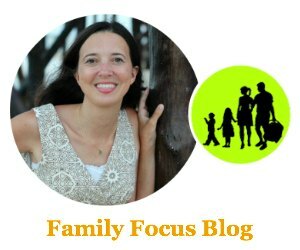 Do you love finding new edible wild foods too? Do you think you will transplant mayapples to increase your edible landscaping? You may also enjoy this article on transplanting daylilies as part of your edible landscaping! How cool! I’ve never heard of may-apples. I think I’ll take a walk in our back acreage again and look for some! Can mayapples be dug and potted for transplanting later? Sure. However, every time you mess with their roots they are vulnerable so less is better and easier.